The 5 Nations Care Forum is an alliance of the professional associations representing the care sector across the UK and Ireland. Through a collective commitment to information sharing, joint lobbying, shared learning and support, the aim of the 5 Nations Care Forum is to add value to members’ activity by promoting the interests of service recipients, staff and service providers. The Forum seeks to encourage the development of a joined-up approach to matters which have a UK-wide or European dimension. 6. models of sustainable funding. individuals in ways that maximise dignity, choice and control in outcome-focused ways. The 5 Nations Care Forum will support providers to develop and deliver personalised care and support services actively involving individuals and their families. Our aim will be to cooperate in ways that facilitate the promotion of dignity, market choice and quality care provision. Workforce planning and workforce development are essential factors in the delivery of quality care. Recruitment and retention, training and qualifications, continuous learning and skill development, as well as terms and conditions, all have to be part of a Workforce Plan for the sector to meet current and future needs. Ideally too, this plan should transcend individual employing bodies and provide a level playing field for people to develop career paths which retain experience and expertise alongside commitment and motivation within the sector as a whole. Professional registration also has to facilitate the mobility of trained staff across regional and national boundaries. The focus of the 5 Nations Care Forum is to raise the professional standing of social care staff; identifying core skills, knowledge and competencies; providing professional development and exchange opportunities; and highlighting the workforce requirements for the future. Media images of the care sector too often focus on the negatives and fuel the anxiety and concern of older and vulnerable people and their families when difficult choices and decisions about accessing care services are being made. Providers must therefore be proactive in relation to public education and the balance of media content. Part of this may require a willingness to be more, rather than less, open with the media so they can understand better what care services are about and able to see first-hand the high levels of skill, dedication and practice across the sector. 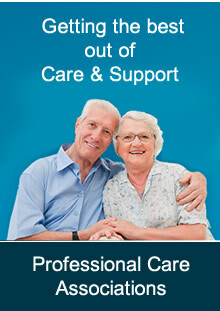 information and promotional material in relation to care services. Maintaining links with other initiatives, such as My Home Life, is also important. Public policy at a national and local level must provide a coherent framework for health and social care planning, funding, regulation and service delivery. As such it needs to be based on an inclusive dialogue with all stakeholder groups. Meeting the twin challenges of demographic change and fiscal constraint requires us to look at the most effective use of resources across all parts of the health and social care sector to deliver the best outcomes possible. The focus for the 5 Nations Care Forum is to raise social and health care provision for older and vulnerable people up the political agenda and to ensure there is well-informed debate on future policy goals and aspirations. Providers recognise the importance of regulation and inspection in establishing a clear framework of standards, monitoring performance, signposting areas for improvement and providing public assurance. At the same time, the regulation of care provision has to support, and not impede, service delivery and service development, and has to be consistent in its application. Regulation should also be based on a partnership with the sector such that service providers, together with service users and commissioners, feel a shared ownership of both the standards, outcomes and the process. The focus for the 5 Nations Care Forum is to compare and contrast the frameworks of regulation across the different jurisdictions, in order to learn from the best, and to promote approaches to self-evaluation which assist providers in relation to both internal service improvement and external scrutiny. models should enable a level playing field between the public, private and voluntary sectors in order to ensure efficiency and best value for the public purse. The commissioning of care services should give choice and empowerment to the service user and put quality and sustainability before price. The health and social care sector is a major industry, contributing significantly to national economies and with significant potential for future growth and development. However, this needs to be actively supported by public policy and the priorities within public spending. The focus for the 5 Nations Care Forum in this regard, is to provide robust information on the cost of care and clear analysis of the strengths and weaknesses of alternative funding models. My Home Life (www.myhomelife.org.uk) is a programme aimed at promoting quality of life for those who are living, dying, visiting or working in care homes for older people through relationship-centred, evidence-based practice.